Iris Scissor cvd 11cm/4 1/2"..
Dressing scissor s/b str. 14cm/5 1/2". Also available in s/s, b/b..
Dressing scissor s/b cvd. 14cm/5 1/2". Also available in s/s, b/b..
Mayo scissor str. 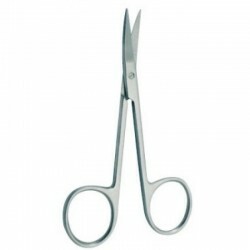 17cm/6 3/4"..
Mayo scissor cvd 17cm/6 3/4"..
Metzenbaum scissor str. 14cm/5 1/2", 18cm/7"..
Metzenbaum scissor cvd 14cm/5 1/2", 18cm/7"..
Lister bandage scissor 14cm/5 1/2"..
Wire cutter scissor 11cm/4 1/2"..